Following the openings of La Rambla and Market S.E.A., Dear Lilly is the latest that has yet to be fully explored. Taking a space on the IFC mall rooftop moments away from the soon-to-be-packed Shake Shack, the new restaurant and bar is the fourth location opened by international cocktail bar maverick Ashley Sutton. 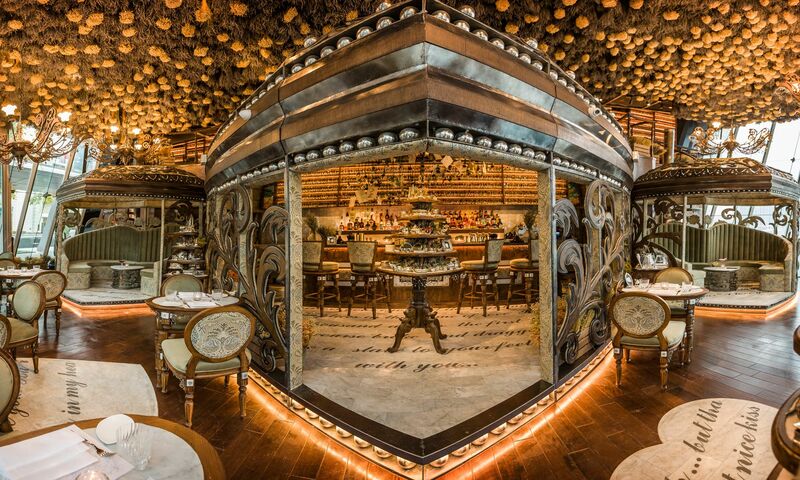 Known for his eye for detail when it comes to creating bespoke themed cocktail bars, Sutton has already given us oriental cabaret via Ophelia and cool J.Boroski to the butterfly-themed The Iron Fairies and, now, Dear Lilly. The theme this time is love, and as romantic as it may it seem, to be dining within a space under a ceiling of inverted bunches of dried lavender and camomile, it almost felt like entering a granny’s potpourri-packed drawer. It is unfair to judge the room by its aroma, so if you are not a fan, you’re more than welcome to take a seat outside (though the caveat is that this area is self serviced due to licensing limitations). Meanwhile, the interior is bejewelled with inverted dried blossoms preserved at their respective prime, and the wooden floors are laden with quotes about beauty and love. Semi-private atriums are located at the humble space’s centre, sandwiching the main bar, where the magical mixology happens. The emporium that is the restaurant, however, is packed with tables that are unevenly crammed throughout the space, where elbow room and leg room are in short supply. The cocktail menu showcases page-after-page of signature cocktails, themed around combination liqueurs and high-proof booze with fruits and flowers, to stay with the blossom theme. Arguably the most popular new venue in the area, Dear Lilly was very full at the times of our visits. Guests can order wines by the glass or even sodas, but it is the cocktails that are on every guest’s table. Offering classics and a list of restaurant’s signatures. The Instagrammable cocktails are served very cold, but also very sweet. The Green Fairy offers a touch of absinthe foam, while pineapple juice and coconut water was mixed with yuzu for a tropical touch, Mademoiselle Lilly is a fruity cocktail where vodka meets lillet blanc, together with lychee liqueur and cranberry juice. The concoction was too sweet, masking the real flavour of the fruit. The food menu takes on an International twist, and the buffalo wings are of jolly good standard, and the blue cheese dip is slightly less pungent. The mezze platter, a vegetarian starter, showcases roasted aubergine dip, hummus, and tzatziki, or yoghurt cucumber dip, combined with falafel balls and grilled flatbread. The cool mint from tzatziki marks the highlight of the trio of dips, while the miniature falafel balls are crispy on the outside but light within. Slow-cooked octopus is generously slathered with herb dressing after being slow-cooked and seared on the hot pan. The octopus is tender and yielding to the bite, while the herbs give these thick tentacles a herbaceous twist. The puttanesca pappardelle, however was disappointing. The pasta, despite being al dente, was suffering from over seasoning, where the chefs may have put a heavier hand on puttanesca element of anchovies, olives, and cheese, which all add intense savoury notes. While some diners ordered the seafood platter, but we felt saving the appetite for desserts and cocktails would be a better option. The Lilly Heart features raspberry and white chocolate. The mousse is on the sweet side, cloyingly so, and the berry’s iconic tartness was masked by the dish’s sweetness. The apple yuzu cremeux fares better, with yuzu’s sharpness cutting through the richness from the cremeux, which was not uniformly homogenous, leaving a rather sandy texture. Service is a tricky business at Dear Lilly. Yes, there is a no-reservation policy, but there is a phone number listed and it’s as good as none, as our telephone inquiries were never tended to. Walk-ins must leave their personal information to be notified should a table open up, and on most nights it will likely be over an hour’s wait. On our first visit, we were informed of a kitchen burst prompting the restaurant to stop serving food after we have placed our orders. The team could have handled the matter better by informing us earlier but they failed to do so, and they admitted so. However, most of the staff are friendly and the service team are mostly knowledgeable on its menu’s offerings.